Nico Whitlock opens the Mental Health Monologues hosted by Active Minds on Feb. 22. Photo by Maggie Gautrau, Photo Editor. Throughout history, storytelling has provided a way to capture pieces of our personal history and share them with others. While this can help the storyteller heal or process, it also allows the listener to gain an in-depth understanding of the world around them. On Thursday night, Feb. 22, the University of Maine’s chapter of Active Minds hosted the Mental Health Monologues. 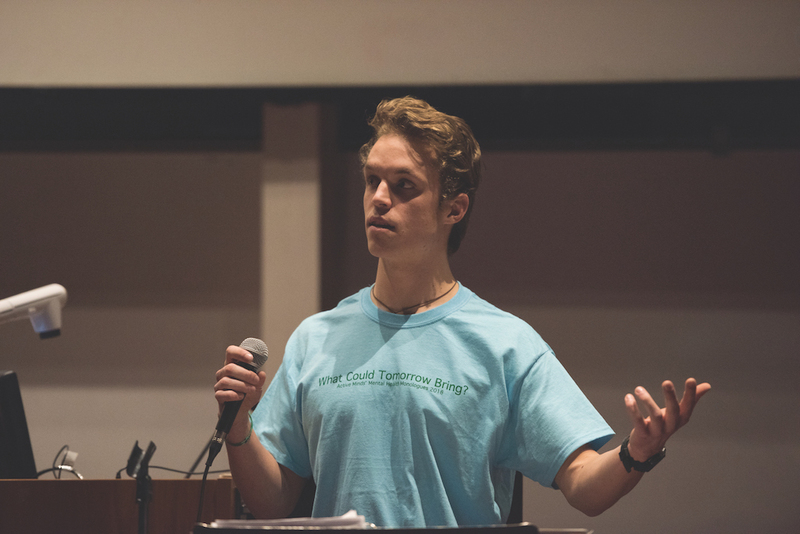 For the second year, community members gathered in room 100 of the Donald P. Corbett Business Building to hear their peers share their personal experiences surrounding the issue of mental health. The event hosted a diverse group of 12 students who used their voices to educate and inform on a variety of topics surrounding mental health. Active Minds has worked since 2012 to change the conversation and stigma around mental health on campus. Through multiple events each semester and weekly meetings, they hope to act as a support system for struggling students. Shayla Kleisinger, a third-year biomedical engineering student, closed the first act with a monologue discussing her personal experience with bipolar disorder. Using the rhythm of a beat poet, Kleisinger shared the intimate moments of her struggle. She attributes the ability to share her story publicly to the inner strength built by her difficult experiences. While she was on the crew of last year’s event, this year she decided to take the stage. She believes the event is important in reducing stigma and reminding students that Active Minds is a community available to those who need support. “We aren’t alone. Even though this campus feels big, and it’s easy to sometimes feel lost in the crowd or that no one understands what you’re going through, we all can share in the bad but more importantly celebrate the good,” Kleisinger said. At intermission the audience was encouraged to check out the community-created origami quilt, or visit tables offering free pins, information on campus counseling and raffle tickets for sale. Last semester, Active Minds collected 1,100 origami squares to represent the 1,100 American college students who die by suicide each year. While tabling they asked students “What could tomorrow bring?” and collected answers ranging from “a good bassline” to “thrift shopping.” They hope the quilt will remind students of the positive things each day could bring. In addition to raffle tickets, they sold bracelets engraved with the phrase, “The world needs you here,” and bottles of water to raise funds for Active Minds. The two raffle winners received either a bundle of gift cards donated by local businesses or a stress relief basket. If you are interested in participating in this event next year, or joining Active Minds to change campus stigma about mental health, attending a group meeting is the first step. This semester meetings are held on Thursdays from 7 to 8 p.m., in the Lown Room of the Memorial Union.